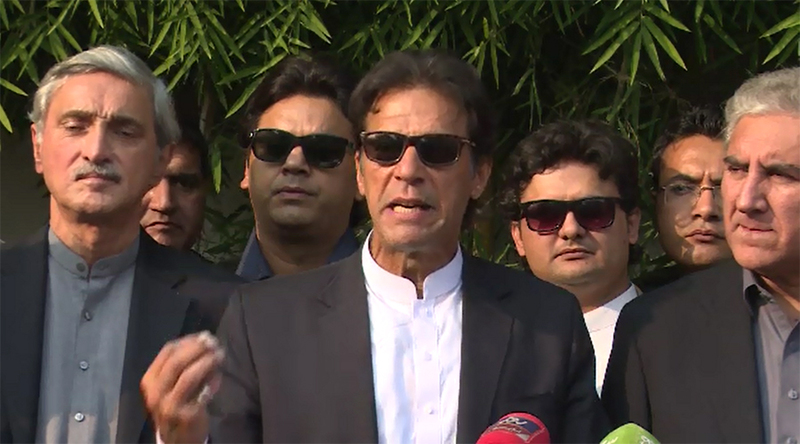 ISLAMABAD (92 News) – PTI chairman Imran Khan has said that the entire government machinery is busy defending Prime Minister Nawaz Sharif and his children. lest Nawaz Sharif calls US President-elect Donald Trump for his defence. He said that now the Supreme Court has also accepted the Sharif family will have to answer several questions. “We want the verdict at the earliest,” he said. The PTI chairman said that they had done their job. “The Supreme Court has accepted our documents. Will now a Saudi prince will tell that from where the settlement amount of US$34 million of Hudaybia Papers Mills came,” he maintained. He said that he was not contesting the case against Nawaz Sharif, but the government and institutions. Imran Khan said that Nawaz Sharif’s son sends Rs 740 million to his son and it should be told that where its tax was paid. “It is also the matter of money laundering,” he added.